Roy G. Geronemus, M.D., is the Director of the Laser & Skin Surgery Center of New York. 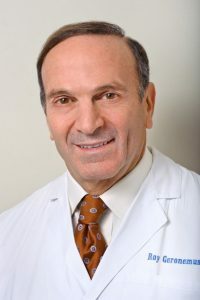 He is a Clinical Professor of Dermatology at the New York University Medical Center where he has founded its laser program and served nine years as its Chief of Dermatologic and Laser Surgery. He is also the Director of the Skin/Laser Division in the Department of Plastic Surgery at the New York Eye & Ear Infirmary. He has been involved with the development of several new laser systems and therapeutic techniques, which are now commonly used throughout the world. He has been listed in New York Magazine’s Best Doctors in New York 12 times, three times in Woodward and White’s Best Doctors in America and in Town & Country’s Best Cosmetic Surgeons. Dr. Geronemus is also the Chairman of the Board of the New York Stem Cell Foundation.